No matter how many times the old pros say it, expectant parents never quite grasp how different life will be after the first baby… until the sweet thing arrives. We’ve all been given similar advice. Well-meaning people wink and say “sleep now; you won’t get any after the baby comes” or “enjoy them while they’re little.” These helpful tips may be true, but they’re cliché and go in one ear and out the other. My husband and I were naïve enough to think our new parent experience would be different. We read the right book, after all, and we bought the right swing. We took the eight-week class. Ha. What we know now, after our third, is that all the preparation in the world can only get parents so far. When the poop hits the Pamper, so to speak, it’s instinct and stamina that’ll get you through the bad months. It’s sheer force of will and a strong gag reflex. And coffee. Lots of coffee. People love to give parenting advice, whether it’s solicited or not, but they don’t often get down to the nitty gritty. There are still some things you might not have heard. If there’s one thing I wish I’d have done better in the early days, it’s asking for help. This is easy to say looking back. At the time, I thought needing help made me a bad mother. I thought it meant I didn’t have the skills required to rear the child I had created and carried. Ah, no. I wish I could go back and shake myself. Accepting help does not make someone a bad parent. For goodness sake, if your partner or family or a friend offers to watch the baby for an hour or two, take him up on it! Take a walk, cruise Target aisles—anything. It’s good for sleep-deprived and overworked parents to remember who they are and not be in charge of someone else for a while. Note to 2007 self and expectant or new parents: healthy parents make for healthy children. Good lord, I could tell you some horror stories. I won’t, but I could. What seems like the most natural and easy thing in the world can actually be really difficult. But it helps to be prepared, to have the knowledge, tools and support necessary before going live. Local resources Arkansas Breastfeeding Coalition and La Leche League of Central Arkansas both have active Facebook pages. Baptist Health’s Expressly for You is a great program, and I’ve read about the AR WIC Breastfeeding hotline (800-445-6175). With so many people telling us what to do, how are parents supposed to know which advice to take and which to ignore? Simple: instincts. Hey, look, we got something for free! You’re equipped for this parenting thing, despite your fears. If something feels wrong, don’t do it—even if the book everyone else raves about says to. I learned something early on that changed my life: If you start to resent a situation, make a change. Don’t stick something out that’s making you miserable because it worked for your cousin. Every situation, every baby, is different. Listen to your instincts. And if those instincts tell you to make a change, well, that leads us to the next point. Adjusting your sleep arrangements? Weaning? Starting a new daycare? Three days. If you can make it three days (or nights), you’re in the clear. Speaking of changes, we parents are in for years of adjusting to them. If I had a train pass for every time I’ve said, “It’s just a stage,” I’d never have to pay the zoo again. In my house, we can go months with great behavior, and then wham! backtalk and mutiny. ‘It’s just a stage,’ they say. ‘Kids need to test their boundaries every once in a while.’ The truth? It’s true. Things eventually go back to normal, lulling us into the false belief we’ve excelled at this parenting thing. It’s cake and ice cream again until out of the blue, someone writes on the sofa with a hot pink Sharpie when there was perfectly good paper within reach (real example). Or maybe, after a solid week of sibling rivalry the kids form a loving truce all on their own. Stages. I can’t keep up. The best I can do is remain constant with rules and reactions. The kids may go in and out of bad sleep patterns and biting, but we’ll be here holding down the fort and a Magic Eraser. So, why? Why do we put up with all of it, the exhaustion, the pain, the frustration? We do it because our hearts have never felt so close to bursting as the first time we heard them laugh. Because one day they’re going to ask to watch “The Goonies” or “The Sandlot,” and a tear of pride will streak our cheek. We do it because parenting is the most important job in the world. Something I read stuck with me because it’s so true. “The nights are long but the years are short.” Nearly 11 short years since the birth of our first child, and four years since our last, and it’s only with fondness that I remember those long nights. 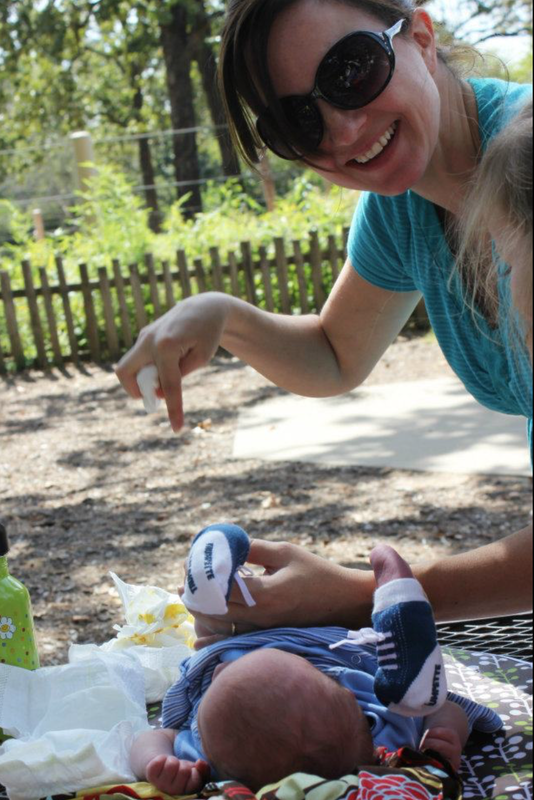 A Particularly bad blowout, and hard parenting moment at the little rock zoo.